In 1977, Gerry Spiess began building a 10-foot plywood-and-fiberglass sailboat in his garage in White Bear Lake. Spiess, a technical instructor at 3M Co., had designed and built other boats and was an experienced sailor. He had sailed down the Mississippi River and crossed the Gulf of Mexico to South America. But two attempts to sail around the world were scuttled by illness and bad weather. 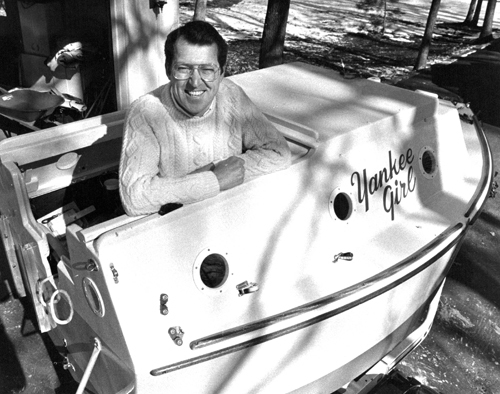 He designed the new boat, “Yankee Girl,” to set a world record as the smallest to cross the Atlantic Ocean. The 750-pound vessel was equipped with four sails (main, two jibs and a spinnaker), a 14-foot aluminum mast, a self-steering mechanism, a VHF radio, navigational gear, a 4-horse Evinrude outboard motor and 60 gallons of fuel. Without a soul to see him off, Spiess set sail from Virginia Beach, Va., on June 1, 1979. The little sloop was loaded with provisions, including beef jerky he and his wife, Sally, had made in their kitchen. To stave off boredom and loneliness on the 3,800-mile journey, he packed books by Mark Twain and recordings of old radio programs. One of his regrets: He did not bring a good pillow. Thousands of well-wishers greeted Spiess upon his arrival in Falmouth, England. He did not do it again. Instead, two years later, the White Bear Lake sailor climbed aboard Yankee Girl and set out to conquer the Pacific Ocean. He made the 7,800-mile crossing, from Long Beach, Calif., to Sydney, Australia, in 153 days. His tough little boat was donated to the Minnesota Historical Society in 1984. Gerry Spiess, back home with Yankee Girl after his Atlantic crossing. Sally Spiess visited her husband, Gerry, early this morning. It wasn’t an ordinary get-together. Spiess, 39, White Bear Lake, was about to set a world record by completing an Atlantic crossing in a 10-foot boat, the smallest ever to complete the voyage. Spiess appeared in good health, despite being swept overboard in the early days of his voyage. Mrs. Spiess was in a pilot boat off the Falmouth, England, harbor when she got her first glance at Gerry in 54 days. He set sail June 1 from Virginia Beach, Va., in “Yankee Girl,” the boat he designed and built in his White Bear Lake garage. 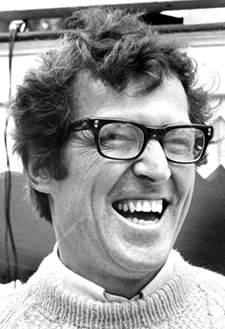 United Press International reported that Spiess edged Yankee Girl close to the towering 40-foot Falmouth pilot launch Link, to talk to his wife and his parents, Louis and Jeanette Spiess of St. Paul. He said he was swept overboard one day early in the voyage. “I was saved by my lifeline. It held fast. I gave a tremendous pull and managed to haul myself back on board Yankee Girl. He looks fine, she said. “He’s grown a beard since I last saw him. He’s lost a little weight – in fact he’s thinner than I’ve ever seen him. A flotilla of boats flying the U.S. flag and blowing horns flocked around Spiess’s boat about a mile from shore at 11 a.m. today. Residents of Falmouth were preparing a gala reception for Spiess at the Royal Yacht Club. Spiess designed his wood-fiberglass boat “for the optimum food and water carrying capacity,” his wife said. “He brought a lot of tinned food, granola and beef jerky, which we prepared at home in our kitchen. The six-foot-wide boat has a narrow bunk, a small chart table, a tiny galley and an emergency four-horsepower motor. The boat has a self-steering mechanism that kept it on course while he slept. The final hours of Spiess’ journey were described by a British Coast Guard official as among the most dangerous of the voyage because shipping lanes approaching the southern coast of England are crowded with tankers and freighters. Visibility was only one-half mile last night. “He likes a challenge, and he’s dreamed about this for quite a while,” said Bill Mezzano, a friend of Spiess who used to work with him at the 3M Co.
Spiess, 38, who had been a technical instructor at 3M, left the company early this year to prepare for the voyage, Mezzano said. “He’s not doing it for the publicity, he’s not doing it for anybody but himself,” Mezzano added. Spiess avoided loneliness on his voyage by taking several volumes by Mark Twain, a tape-recorder and recordings of radio shows. The Spiesses, who have been married almost 17 years, “have always sailed,” Mrs. Spiess said. Spiess has built four sailboats, three of his own design. He has tried twice to sail around the world. One voyage was halted because of bad weather, the other because he got sick. Spiess left on his latest trip with instructions to his wife not to worry until 90 days had passed. He predicted the crossing would take 60 days under favorable conditions. The 1979 Guinness Book of World Records lists a 12-foot boat as the smallest before this to cross the Atlantic west to east. That boat, the Nonoalca, captained by William Verity of the United States, went from Fort Lauderdale, Fla., to Tralee, Ireland, in 66 days in 1966.